Description: NGC 4826 (M64), the Blackeye Galaxy. This galaxy is located some 16 million light years from Earth, and is a spiral galaxy similar to the Milky Way and the Andromeda Galaxy. This type of galaxy comprises a central elliptical core surrounded by a ring of spiral arms. 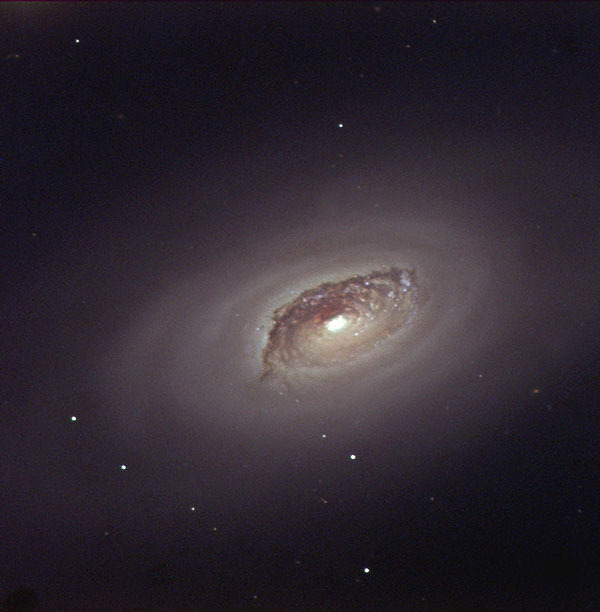 The Sa sub-category of this type of galaxy comprises the tightest spiral, with the Sb and Sc types progressively exhibiting more loosely coiled arms. Credit: ING Archive and Nik Szymanek. Telescope: 1.0-m Jacobus Kapteyn Telescope. Filters and exposure times: B, V and R.